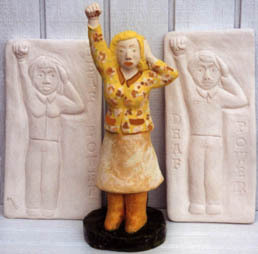 The image above is from http://home.earthlink.net/~aslclay/ (ASL in clay), which is no longer extant. Chinese Dance. This is called the Thousand-hand Bodhisattva dance. It's performed by 21 deaf girls and boys from China's Disabled Peoples Performing Art Troupe. A group of Deaf friends were walking along when an old couple walked past. The old farts glared at the Deaf signers. One of the Deafies knew a little bit about the discrimination in the early and mid 1900's. He jumped in front of the old couple, startling them, and yelled, "Eeeeiii-eeeiiiiii!!!! We are using monkey language!!! Hoooh heeh hoo-hooo-hooooouuuu heee!!! You got a problem with that?? Hooh hooh???" The old couple looked embarrassed and quickly ran away. Live at SMI! Sign Media, Inc. This unique and exciting series of videotapes features the nation's finest Deaf entertainers. Each show is taped in a cabaret setting created in SMI's own studios. Voice-over is provided. (1) Mary Beth Miller, (2) Gil Eastman, (3) CHALB, (4) Bill Ennis, (5) Patrick Graybill, (6) Eric Malzkuhn, and (7) Elinor Kraft. 1. Thomas Jefferson had a deaf slave family at Monticello. Their expertise was in making the finest Virginian wine from its vineyard. 2. Theodore Roosevelt had a deaf guide on his exploration of the West when he discovered an area that is now known as Yellowstone National Park. 3. George W. Bush often jogs with I. King Jordan on the Gallaudet track. 4. Abraham Lincoln learned fingerspelling from Edward Miner Gallaudet at the White House before attending Ford Theater that evening. 5. Dwight D. Eisenhower often used a deaf War Department civilian to send secret codes in Sign Language to his field officers before D-Day to avoid interception by the Nazis. 6. George Washington temporarily used a Yorktown deaf family's home as his headquarters in October of 1781, site of the last battle of the Revolutionary War. 7. Andrew "Old Hickory" Jackson killed a deaf man in a duel over his girlfriend before the War of 1812 in New Orleans. 8. Ronald "the Great Communicator" Reagan had a character role of Alexander Graham Bell in a film which was never released. 9. John F. Kennedy often partied on Martha's Vineyard in which a few local deaf residents were in attendance. 11. A deaf White House aide pushed Franklin D. Roosevelt, a victim of polio, in his wheelchair on his campaigns for re-election. 12. Richard M. Nixon was the first president to use a certified Sign Language interpreter. Unfortunately, it was for his resignation speech shortly after Watergate. : Which son of the president of the United States knew sign lnaguage and like to use it on a daily basis with the White House police? A: Archie Roosevelt, a pre-teenaged son of President Theodore Roosevelt, learned signs from one of the White House police officers and liked to use it daily. He wanted to volunteer as an interpreter for the deaf White House visitors, but the father nixed the idea! the Deaf Community, then. . .
know a pair of Deaf twins. When they were babies, the teachers and doctors told their mother (a single parent) not to sign to them. But these bright little boys spontaneously and naturally developed a signed language of their own. They didn't invent a sign language because they were naughty, stupid, or snobbish. These little tykes just wanted to talk to each other, and they started doing it as naturally as trees grow leaves. They were apparently sent to at least one fine oral program, but they were not successful there. Later they were sent to a signing program, and they learned to sign like other deaf people . . . sometimes straight ASL, sometimes signs with some features of English grammar, and sometimes a type of signed English with lots of "invented" (to represent English words) signs. They are middle-aged now. And when they are talking only to each other, they still might use their first language, and nobody else on earth can understand them. And nobody who truly loves them would ask them to talk to each other any differently. he best friend of the deaf is not the fellow who gives them advice and assistance. It is the man who asks them for it. - George Propp in The Nebraska Journal. here are people who think deafness is a handicap purely because they are under the illusion that they are saying something worth hearing. he problem is not that the [deaf] students do not hear. The problem is that the hearing world does not listen.